I was the kind of kid that didn't ever really ask for any toys or games or anything. It was always a challenge for me to come up with a Christmas or birthday list. Still is, actually. Just ask Sam. There were, however, three things that I *distinctly* remember wanting more than anything else in the Toys-R-Us catalog....one was a wooden train set. Another was, inexplicably, a stupid plastic dog that you could bring in the tub with you. His fabric ears would get wet and you could push a lever on his collar to make him shake his ears, "just like a real doggie!" His name was Rub-a-Dub Doggie and I so appreciate my parents reluctance-yet-ultimate-willingness to buy me such a dumb toy now that I have kids of my own who want dumb toys. 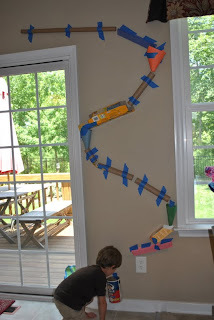 But perhaps my favorite Wish List Toy of all....was a Marble Run. It was made of plastic and came in pieces, so you could build a Brand New Run each and every time you played. 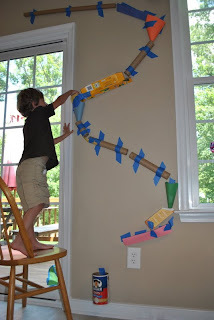 My mazes were full of twists and turns and hills and jumps and loop-the-loops and other Very Exciting Components. Seriously, you guys, you do not understand the depth of my nerdiness. And now I have kids to share in my nerdiness! After spending two hours in a tiny doctor's office this morning, Evan was in no condition to sit quietly and watch a show during Quiet Time. But, after sitting for two hours in a tiny doctor's office, I was in no condition to play Tool Men or Construction Guys or Cars. Sooooooooo.....I pulled out some paper towel rolls and boxes I'd been saving for "Projects" and it just hit me. 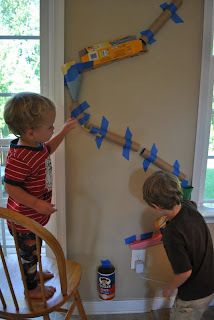 We made our own Marble Run! We started at the bottom (an oatmeal container that we taped to the wall and that acted as the Marble Catcher) and worked our way up. 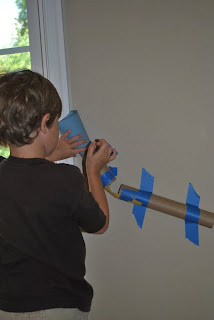 In addition to paper towel rolls and boxes (that we opened up the ends of), we also used construction paper to make V-shaped tracks and funnels. We taped each piece to the wall with painter's tape so we could leave it up for a few days without damaging the wall. We also tested the run after placing each piece to ensure that it would "work." For older kids, I would recommend making the entire run before sending a marble down. An older child can anticipate the motion of the marble and visualize distances and angles better. The lesson would be in the outcome of the prediction, as opposed to the process of learning the physics of the activity. For Evan, who is 4, we would place a piece, send a marble down, and if it didn't connect to the next piece, we would change it right then. It was a good practice in laws of motion, but also in spatial awareness. 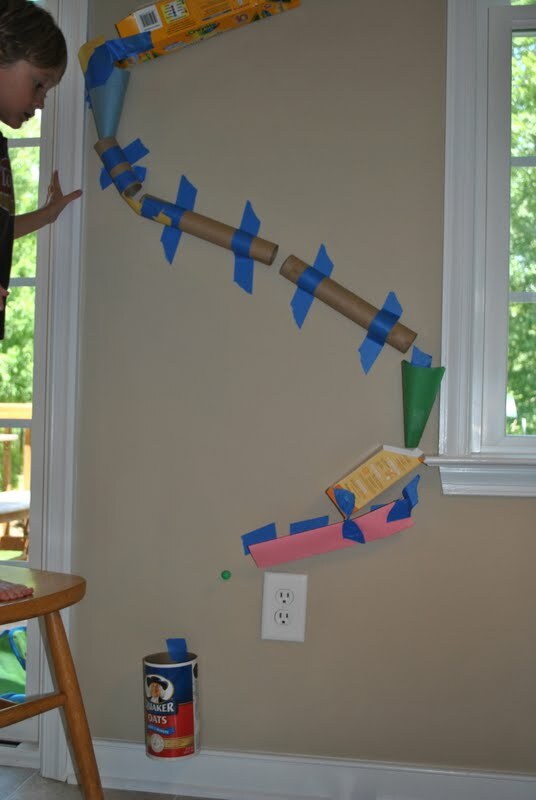 There were several times that I could see him trying to get the track to fit the way he was envisioning it, but either the space constraints of our Marble Run Location wouldn't allow it or the marble failed to stay on the course. It was great to watch him repositioning the pieces until they were successful, but also to redesign the track in his mind as he found which designs worked and what didn't. When at last the run was finished, it was time to play. There were two starting points: The Mommy Lift Me Up Start and the I'll Do It Myself Start. 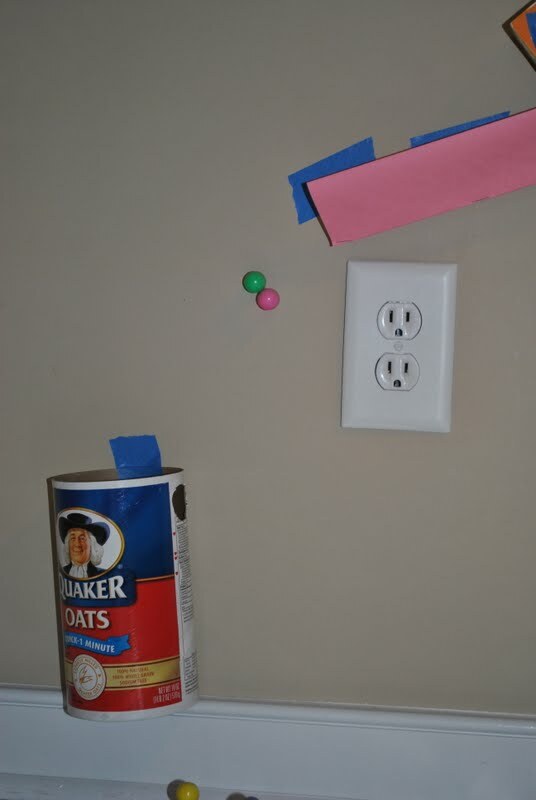 We used magnetic marbles (only because, somehow, we don't have any other kind), which ended up being kind of cool. The run was successful when marbles went down one at a time or in pairs. Three, as is often the case, was a crowd. They didn't end up in the Catcher. Max, who slept through the construction phase, got into it after his nap. It was a good thing he slept for so long, though, because Evan played with this thing for almost two hours straight...and then again before dinner. At one point, it was the Marvelous Fruit Machine. You put in an ingredient at the top and a Marvelous Piece Of Fruit comes out. Anyone care for a white zucchini? An orange lemon? A purple strawberry with polka dots? Then, it was a Grinder. You put in branches and out comes mulch. But wait! If you take it from here, it turns back to branches! It was a factory. It was a map. It was a Secret Ingredient Mixer Machine. It was science. It was pretend play. It was TWO HOURS OF ENGAGED, UNPLUGGED, SELF-DIRECTED PLAY. And we'll DEFINITELY be keeping it up for awhile, taking it down and reconfiguring it to our hearts' content this summer. And next Christmas? You know what I'm putting on somebody's Wish List. Have I ever mentioned how much I love Evan's allergist? It's a lot. 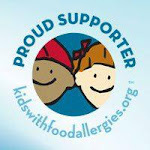 We saw him a few weeks ago for our every-couple-of-months check-up and he said that it was time to reevaluate these food allergies of Evan's. AND....while we were at it, why don't we just go ahead and test Max to see if we're unnecessarily avoiding anything (we are currently avoiding peanuts, treenuts, fish, and shellfish). So today was the big day. They each received 20 pricks (peanut, cashew, hazelnut, almond, brazil nut, walnut, pistachio, pecan, sesame seed (because it's quickly becoming the ninth most highly allergenic food), crab, shrimp, salmon, tuna, and....hmmmm....I guess some other fish and shellfish. It was hard to keep track.). Evan then also received pricks for milk, egg, cantaloupe, and barley....milk and eggs because he still refuses to eat either in the raw form and his challenge "pass" to milk was questionable (read about it here, and here)...and barley and cantaloupe because he's always tested positive to them and has reacted to them either through rashes or eczema flairs. They did great. They were such brave little patients during the test (lollipops helped) and such patient little patients during the two-hour long appointment (the iPhone helped). Both boys tested NEGATIVE to EVERYTHING (almost. Evan still tests positive to milk, but that's neither here nor there. We've seen him drink four ounces of milk with no reaction other than vomiting, so the fear factor of anaphylaxis following accidental ingestion is gone.). Max is allergy-free....well, almost. We still need to avoid penicillins, but I'm pretty sure no kid on the playground is ever going to offer up a taste of some antibiotics. We're not going to go celebrate with a dinner of pecan-crusted tilapia just yet....we'll need to get Evan a RAST test (a blood draw that will indicate his immunocap numbers...numbers that predict actual allergies, not just the likelihood of a reaction, like a skin test predicts). But a negative skin test is 95% accurate, so we're quite optimistic that these pesky old food allergies are rapidly becoming a part of our past. Evan might never drink a glass of milk or eat a bowl of ice cream. I don't care, and neither does he. I can now very confidently imagine him going off to kindergarten without me worrying about what the kid sitting next to him in the cafeteria packed for lunch. Now to find something else to worry about....like, maybe that kid sitting next to him will teach him bad words...or inappropriate jokes...or...[gulp]...be a Sarah Palin supporter. I'M KIDDING! The most interesting thing about today's test, was watching both boys develop Huge reactions to prick number 68. By the time the nurse came in to do the reading, they each had a large wheal and a rapidly spreading red splotchy area on the exact same spot on their backs. I quickly said, "What was number 68? I'm dying to know!!" The nurse kind of laughed and said that number 68 was the control prick...a prick that measures their own level of histamine. She said that both boys had extremely highly sensitive histamine levels and both have dermagraphic skin, skin that hyper-responds to physical stimulation, like a scratch or, in this case, a prick. 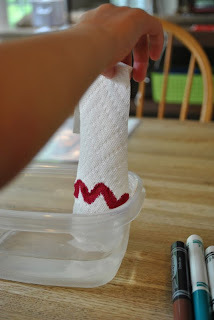 She further demonstrated the point when she took a moistened cotton ball to wipe Max's skin clean....everywhere she wiped turned into a red streak. Oh, my two little sensitive boys. Who can eat just about anything they want. ﻿Tonight was Movie Night at our house. It was a cozy, snuggly event in which I was able to introduce Evan and Max to one of my Disney favorites, Beauty and the Beast. Well, Max caught the first 20 minutes or so. I was thinking back to a year ago...when, on this very night, we were preparing ourselves, mentally and physically, for what was to be Operation: Potty Training. You can relive those memories with me here, here, here, and here. I had heard that Potty Training is Hard, so we were prepared. And yet, while I had braced myself for the worst, it was relatively painless. Easy, even. But the memories didn't stop there. Because, in addition to the words to every song, I can also recite just about every line of dialogue. I really like Movie Night, and I don't want my family to stop inviting me to the couch. And so, I thought back to this night seven years ago. A few hours from now, I'd be laying awake in bed, in the spare room of my sister and brother-in-law's house. Wide awake, but knowing I should sleep; wide awake listening to the rain pouring down and wondering what the hell we were going to do about our wedding that was supposed to be held IN A GARDEN the VERY next day. The next morning, my father-in-law-to-be and various members of my husband-to-be's bridal party headed over to the garden to survey the damage. It was a total swamp. So....they brought out their shop-vacs. I'm not making this up. They, literally, tried to vacuum up the swamp in time for my mid-afternoon nuptuals. It didn't work. ...and throughout the next seven years....and counting. I've heard it said that, like potty training, Marriage is Hard. But, I've come to realize, in the last seven years, that if you marry the right person, at the right time, and for the right reasons, Marriage isn't hard. It's relatively painless. Easy, even. 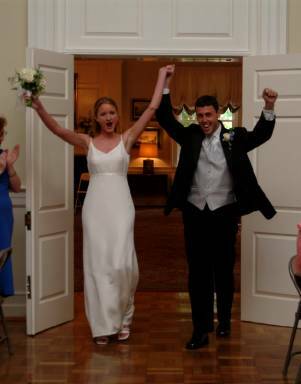 So, Happy Anniversary, babe. And thanks for making it easy....even when I'm the one making it hard. And for always inviting me to Movie Night, even when I can't promise that I won't sing along. I changed, fundamentally, when I became a mother. Of course I did. Nothing can alter your priorities and change the way you live in and interact with the world like having a piece of you walking around in it. I became, at once, more sensitive, more compassionate, more patient (and have had that patience tested ever since), more protective, and more anxious. I've also become more eco-conscious and more liberal as I think about what I want the world that my kids grow up in to look like. But nothing could have prepared me for this....because despite it's popularity where I now live, I never thought it would be a part of my life. But, as a mother, you change because of your child and you change FOR your child. And despite my better judgement, I am embracing it because it is a love of his. I had no choice but to suggest it as a morning activity. Because I knew it would make him happy. And that, in turn, would make me happy. Today, in my very own living room....we played a game I NEVER thought I'd play....we played....[gulp]....NASCAR. Complete with Announcer's Commentary, like, "And Lightning McQueen is pulling ahead in Turn One," and "I don't believe it, folks! Jeff Gorvette is spinning out in the infield!" ....until, shockingly, Jeff Gorvette pulled ahead in a surprise photo-finish victory. What's next? A buck head over the fireplace? I'm KIDDING! I know not all Nascar fans are hunters. But seriously, there will never EVER be a dead animal's head in my house. We're into "Nascar" only because of the Cars movie, and it's highly anticipated sequel. There will be no hunters in this house. And just to make sure, we'll watch Bambi ad nauseam. Never say never. Well, unless you're talking about killing Bambi. Eewwww. Evan decided to get rid of the binkies tonight. Yes, he's FOUR, but this is a practical MIRACLE. And if you're judging on the 4-year old With Binky Issue right now, then it's because you clearly have never had a child who Does Not Sleep. So stop judging and just be thankful. Because ohmygod have those binkies been a life-saver....or a sanity-saver at the very least. We had a rocky day as a result of a near all-nighter pulled by the 4-year old. He was cranky, impulsive, too rough, and just plain....tired. So, as we were getting the boys ready for bath, I had the It Was a Bad Day But Tomorrow Will Be Better Lecture/Pep Talk. I concluded with, "I think it was especially hard to make good decisions today because your body and your mind were so tired. You didn't get a good night's sleep last night." "And, I'm just saying: You don't NEED your binkies to have a good night's sleep anymore. You're so big. You're four. Maybe it's time that we send your binkies to a baby that doesn't have any binkies." He looked at me for slightly longer than a contemplative beat and said, "Well, alright." "Attn: Please deliver these binkies to a baby who does not have any binkies." There were some sad musings...."I'm just sad that I'm saying goodbye to my binkies." "I guess it's a happy thing to give my binkies to a new baby....but I'm still pretty sad." But after tickling his back for a slightly extra long time, he fell asleep...with just his three bedtime buddies, his tiger "Tigee," his snake "Snakee," and his bear "Buddy." This is where we were in March of last year. We've BOTH come a long way, baby. Fingers crossed, but I'm extremely optimistic for yet another milestone reached.....and I reeeeeeealllllyy hope we ALL get a good night's sleep tonight. I mentioned Max's growing vocabulary...but I feel as though I sold it a bit short. This kid is adding sounds and words and sentences so fast that I don't even really notice it. That's weird, isn't it? But it's true. With Evan, this language development was so different. Evan was a sign-language kid. He wasn't a babbler by any means--few coos and practice words, and little sound-play...although he did say "Buh" an awful lot-- but he communicated beautifully through signs and gestures. And his communication wasn't limited to need/want fulfillment, either. He knew signs for food, drinks, time of day, animals, trucks, elements of nature, and manners (please, thank you, I'm sorry, etc.). He was also a really great siren/motor noise maker. What more did a 1-2 year old kid need to say? So he was quiet. Really quiet. Until the summer after he turned two. We were at Barnes and Noble reading a book about trucks. I turned the page to reveal a full-color spread of the coolest truck of all: "Backhoe!" Evan said. I looked at him. "What did you say?" "Izza Backhoe," he repeated. He literally went from zero to full sentences. Apparently, I was the exact same way. Big surprise, right? Could this kid BE anymore like his mama? But not my Maxwell. Maxwell is the Expert Babbling, Sound-Practicing, Word Play Beginning Talker. The thing is, the development is unfolding so before-my-eyes that I'm almost missing it. Which is why I'm recording this story here. And then, of course, there are the Defiant Nos. "No" repeated at an alarming decibel as I'm brushing his teeth, or putting on his shoes, or strapping him into his carseat, or trying to carry him across a parking lot. And so it wasn't much of a stretch to change that final vowel sound from /o/ to /ee/. Today at lunch, Max stood up abruptly in his seat and turned to look at me as I was preparing my own lunch at the counter behind him. "KNEES!" he shouted, hands on his knees. "That's right, babe, those are your knees!" "Yup! Those are your knees!" "Uh-huh. Knees! Bend those knees!" [bending knees] "Mama Dada KNEES!" "Okay, yup. Mommy and Daddy have knees." [pointing at Evan's knees] "KNEES! KNEES! KNEES!" Evan: "Yes, Maxwell, I have knees, too," and then with just a hint of exasperation, "Everyone has knees." And so it went throughout the rest of lunch. A fascinating, stimulating conversation about knees. And it didn't stop there. After lunch, Max found the baby doll's knees. 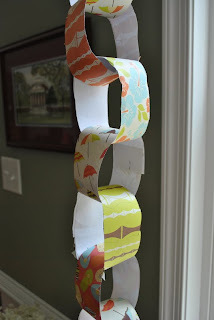 The knees of the elephant in the book we read at naptime, and, in the next book, "No. No knees," as he pointed to a balloon. And thus, a new word was added to his exploding vocabulary today. And now he's sleeping off the excitement. I can't wait to hear what word tomorrow brings. And, that word looks very funny in all caps. "Max, say 'boo boo baloo'." "Max, say 'poopie doo doo'." At which point the game ends and the Potty Talk Lecture begins. Max is snuggly, and cuddly, and affectionate. His hugs are free and frequent and I'll often catch him patting Evan's back or trying to hold Olivia's hand. He's a lover. He's also a pistol. This is the kid who's flailing his body out of my arms yelling, "WOK! WOK! WOK!" As I'm trying to convince him that I Will Not let him walk across a parking lot by himself. This is the kid that throws his body on the floor of the store when I tell him that he must not run while pushing the stroller down the aisle. This is the kid that pushes my helping hands away when I'm trying to assist him in climbing up the ladders and apparatuses on the playground. This is the kid who sticks out the biggest bottom lip when pouting over hearing "No, you may not hammer Evan." As much as the behaviors may be tiresome, the independent streak, the confidence, and the I'm A Big Boy mentality, are all good things. A dozen times a day, maybe right after I announce that breakfast is ready, or when I tell the boys to get their shoes on so we can go to storytime, or when Brennan comes home from school, Max's happy little face lights up, he claps his hands together, and he shouts, in the most joyful, adorable voice in the world, "YAY! YAY! YAY!" It really does just keep getting better. My name is Sarah. And I'm a Blogger. As an Affiliate Partner, I will be participating in the Book Review program, where I'll occasionally review a book that is provided to me by BlogHer. The review will be my true and honest impression of the book, but I'll always let you know if the book was given to me or purchased/borrowed on my own. I may choose to become a Product Reviewer, too. And again, I'll always disclose if the purchase was my own or if a product was provided to me to review. You know: Full disclosure. It also means that, hopefully, I'll eventually be joining the Network as a full-fledged member. At that point, I will have advertisements placed in the sidebar of my blog. Nothing too intrusive and nothing offensive. You'll always be able to open this page with a curious kiddo sitting next to you. I'm really excited about this. I have been reading blogs for awhile now and am constantly amazed by the lives and the experiences and the Lessons Learned by the women who write them. I am so happy and humbled to be considered for membership in this network. People do this for a living, you know. Can you imagine? Writing?! About your FAMILY! FOR A LIVING?!! I'm not getting ahead of myself. Promise. But, CAN YOU IMAGINE?! Evan is at that age where he is obsessed with When? and How Many Days Until? and But a Week is SOOOOOO LOOOONNNNNGGGGG. And this is about everything....When are we going to see Mom Mom and Pop? When will I be 5? When can we go to Red Robin again? When does school start? How long are the cousins staying? When are we going to the beach? This is the big one. I field this question on a nearly daily basis. Because a week feels like forever....imagine the concept of a month. Too big to bear. 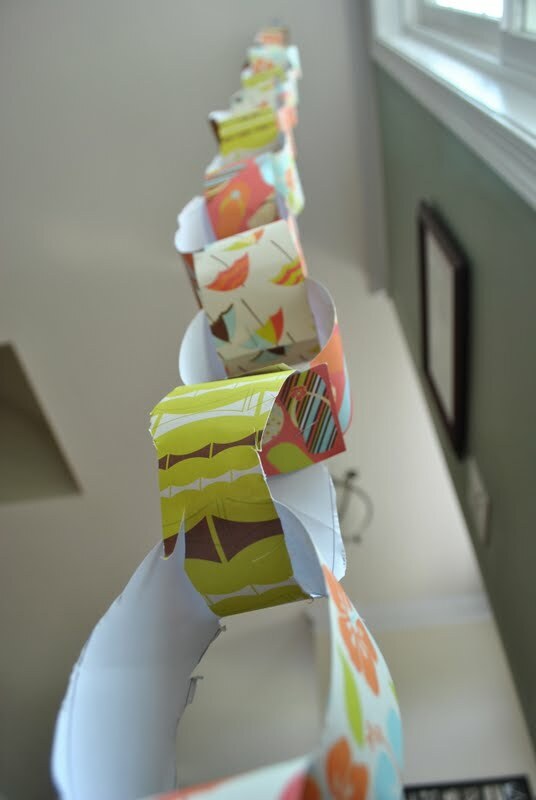 A paper chain made with beach-themed scrapbooking paper to help us count down the days until we're back in the Carolina State of Mind....basking in the sun....chasing a sandy runaway baby down the shore....digging and scooping and shoveling to our hearts content....Coronas every day at Quiet Time and S'mores for dessert every night....my kind of livin'. With my kind of people. It doesn't matter if you're 4 or 31: A 30-link chain, counting down to the beach, is SOOOOOOOO LOOOOOOONNNNNGGGGG. Max and I went out to Our Garden to pick some basil for dinner. Because we can do that sort of thing. Because we're practically farmers. That is one cute farmer. 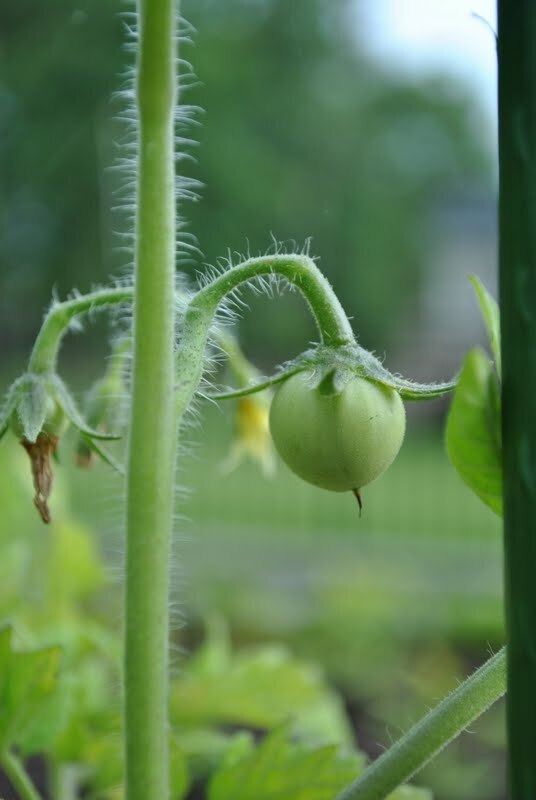 Before we know it, the tomatoes in that recipe will be homegrown, too. I was browsing through the latest Parents magazine, not really reading anything in particular but skimming to make sure I wasn't missing some important Parenting Breakthrough, when I came across a section called "Science Fun." You know I stopped to read it. 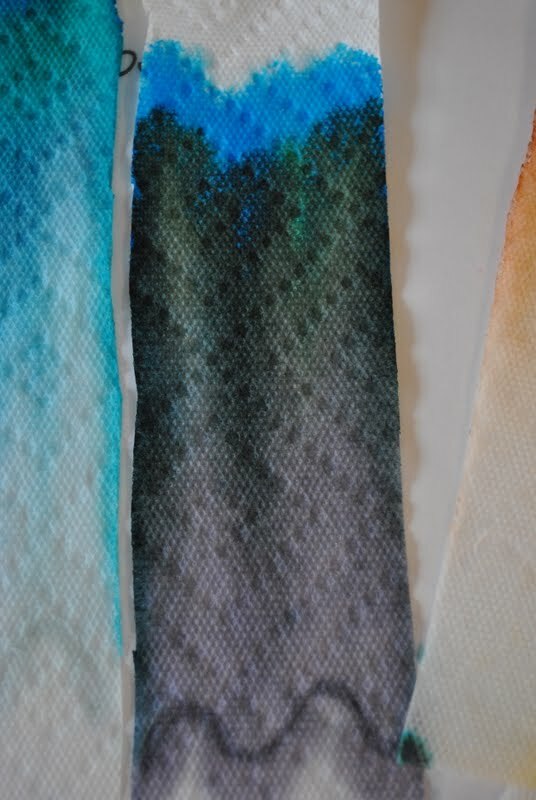 The first experiment was called "Mystery Markers," but it's really a lesson in chromatography, which is the process of separating out colors in a dye. 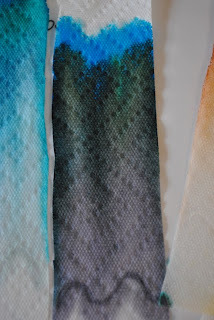 First, assemble your materials: Paper towel strips, markers (stick to non-primary colors like purple, fuchsia, turquoise, and black), a bowl of water, and a placemat to lay the strips on to dry. 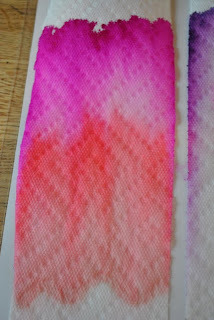 Next, draw a squiggly line on the paper towel, close to the bottom of the strip. 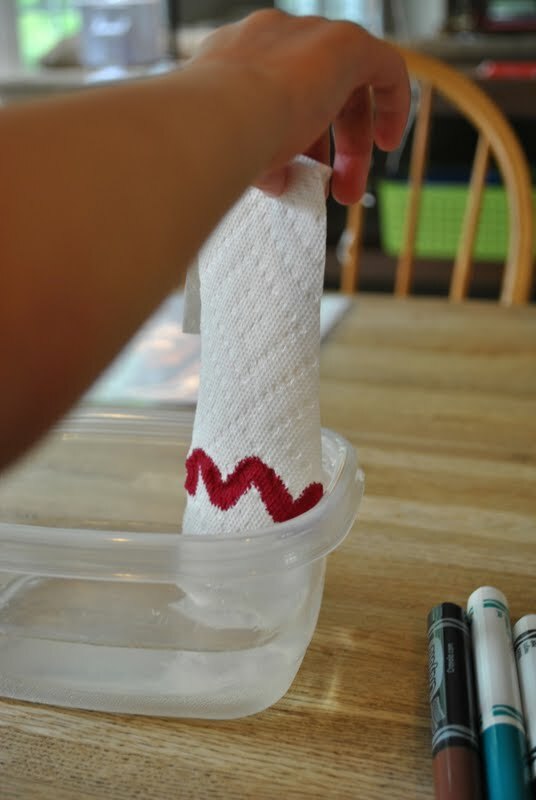 Have your kiddo hold the strip above the bowl of water so that the bottom of the strip is in the water, but not the marker line. The water will begin to seep up the paper towel and the color will spread with it, revealing different hues within the dye of the marker. From left, our markers were: primrose, purple, teal, black, and brown. 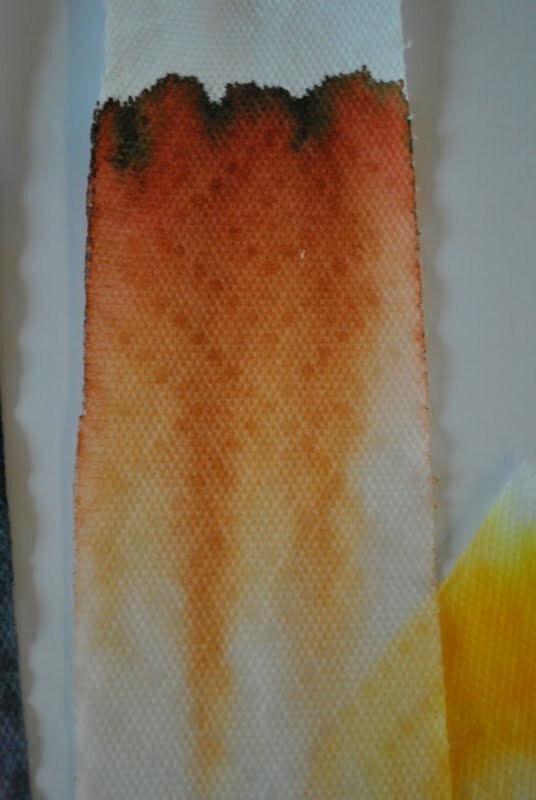 I know it's a *few* years off, but wouldn't it be a cool Science Fair project to test the primary colors of different brands of markers to see which brands had the purest dyes? 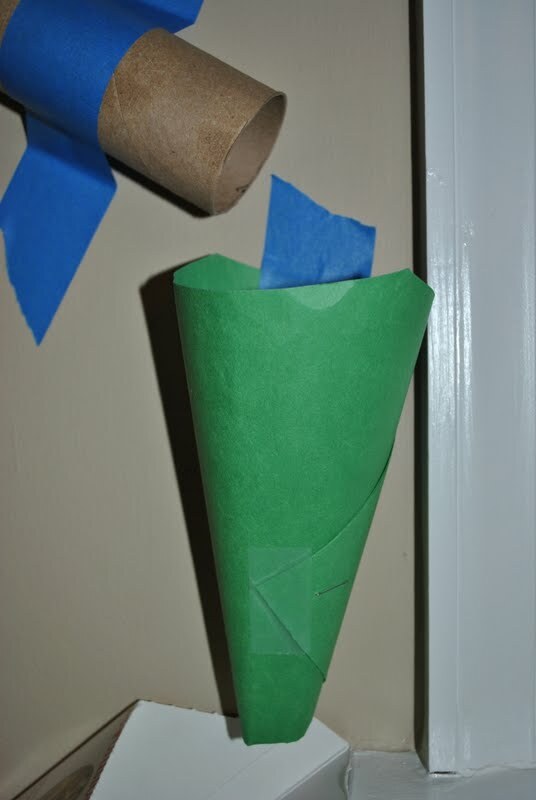 I'm totally suggesting it to Evan or Max if either one needs some ideas. For his fourth birthday, we gave Evan a Big Boy Bike. It was love at first sight. 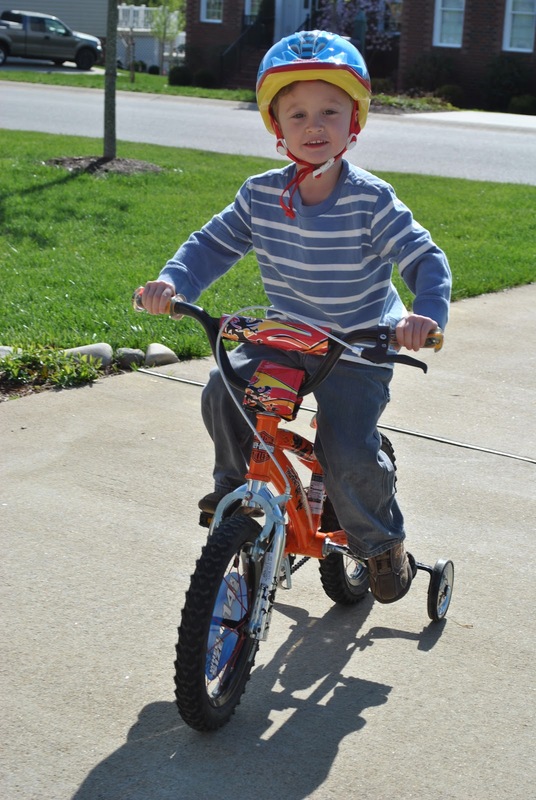 He was making his loops around the driveway on his second day as a Big Boy Bike Rider, and took a turn too fast. He fell to the ground, the bike pinning one leg down. It wasn't an injurious fall...just a superficial scrape on his jeans-covered knee, but his ego and his confidence were dealt a tremendous blow. I picked him up, dusted him off, and encouraged him to get back on the bike. I let it go for a few days, knowing that the fall, however minor, probably scared him. For the next few weeks, I brought it up every few days. "Hey, Evan! Let's give that bike another go!" "I have an idea....let's go for a bike ride!" "Wow, buddy, that is One Cool Bike over there....wanna ride it?!" I shouldn't have been surprised that I couldn't convince my stubborn little guy. So I tried to approach it from an emotional direction: "It was pretty scary when you fell off of your bike, right? Well here's what we can do....you can sit on your bike and I'll keep my hands on it until you feel comfortable riding by yourself. With my hands on it, your bike won't fall." "You know, kiddo, falling off of your bike is part of learning how to ride. I used to fall off of my bike, too. So did Daddy. But with lots of practice, we started to be able to ride our bikes all the time, hardly ever falling off. You'll see that it'll be that way for you, too." We were playing at the cousins' house at about the one-month-of-no-riding mark, and he saw his older cousin fall off his new Even Bigger Boy Bike. Brennan crashed, hopped up with a "Whoa!" and a laugh, and got right back on. "Did you see that, bud?" "Maybe when I'm Brennan's age I'll ride my bike again." Today I went to the grocery store. As I stood in the produce section catching up with a former co-worker, I received a text message from Sam: "Text when you're on the way home!" it said. Of course I didn't wait until then. I immediately called home to find out what was going on that I needed to know about. "Are you on your way home?" Sam asked. "I'll try to keep him on it until you get home....he's already been riding for 20 minutes!" I don't have to tell you that I had to keep a close eye out for cops on the way home. I just had to get there in time to see it for myself. As I pulled around the corner, I could see him pedaling away, a huge smile on his face. I rolled down the window and did the kind of whooping and hollering that, in just a few years, will embarrass the hell out of him. But for now, he basks in it. I jumped out of the car...."Look at you!!" I cried. "I'm riding my bike!" he replied. And he did so for another half an hour. And he didn't fall off once. Maybe it's time I get a 2x4 and hit myself over the head with it, but I think this time I've finally learned my lesson with Evan. Whatever the problem, no matter the situation, he'll figure it out. He may take awhile. He may seem to backtrack in the meantime, but he'll get there. He'll learn how to interact with others in a classroom. He'll figure out how to solve his own problems of having wet socks or needing to wear shorts. He'll decide it's okay to wear a costume or sing aloud. He'll get his hands dirty. He'll get over a fear. He'll ride his bike after a fall. I need to relax about this kid...and to stop pressuring him to do a certain thing at a certain time or in a certain way. I need to trust him...and to let him take his time and follow his own path. And to cheer loudly and embarrassingly when he gets there. Because he'll always get there.